From 1990 to now our real economic growth has been about 88% but our emissions are down. So our actual gross national emissions have gone from about 563 million tonnes in 1990 to 548 million tonnes or thereabouts at the moment. What does that mean? That we have nearly doubled our productivity relative to our carbon intensity. So there are very few countries in the world that have seen that decrease in their intensity… I would challenge you to indicate if there’s any other country that has achieved a greater reduction in the intensity of their emissions per unit of GDP over that period of history. Any other country. – Greg Hunt, Federal Minister for the Environment, to the Australian Emissions Reduction Summit in Melbourne, Wednesday May 6, 2015. Reduction in emissions intensity is an important measure of how well a country is doing in cutting greenhouse gases while continuing economic growth. 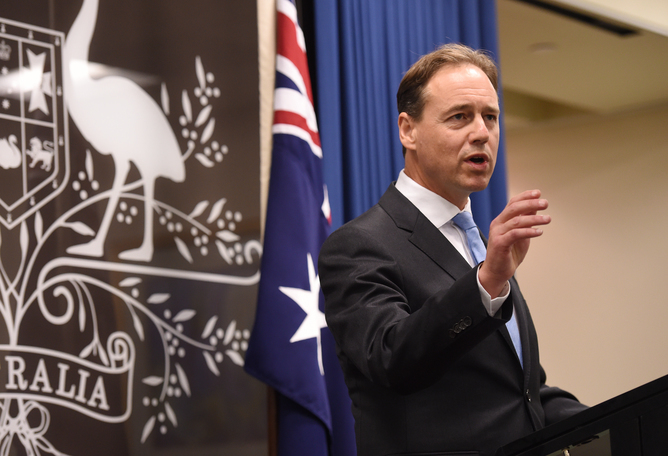 Recent comments by Federal Minister for the Environment, Greg Hunt, implied that Australia is leading the world in reduction of emissions intensity. To calculate emissions intensity for each country, you need its total greenhouse emissions and total GDP. You divide the emissions by the GDP and that tells you how much CO₂ equivalent it emits for each unit of output (for instance, per $US of GDP). The change in emissions intensity between 1990 and now is calculated by taking a country’s emissions intensity now and dividing by what it used to be in 1990. You subtract that result from one. It’s usually expressed as a percentage, so you have to then multiply it by 100. For example, say a country’s emissions intensity falls from 0.52kgCO₂ equivalent/$US of GDP in 1990 to 0.08kgCO₂ equivalent/$US of GDP in 2012. That works out to be an 85% reduction in emissions intensity. 0.85 x 100 = 85%. How did Mr Hunt calculate it? Mr Hunt’s quote was in an answer to an audience question, and not part of his prepared speech. Australia is the only developed economy that has achieved positive GDP growth in every year since 1990. Despite this impressive economic growth, the Australian economy continues to become less emissions intensive. Australia continues to rank as a top performer amongst the 196 parties to the UNFCCC in terms of reducing the emissions intensity of the economy… The Minister’s statement “there are very few countries in the world that have seen that decrease in intensity” is absolutely correct. It’s true there are few countries in the world that have reduced their emissions intensity as much as Australia has. However, Mr Hunt’s challenge to find any other country that has achieved a greater reduction in emissions intensity since 1990 implies Australia is ahead of the world in that regard. That is not correct, as Mr Hunt’s own table shows. Our own calculations also show Australia is not leading the world in reduction of emissions intensity since 1990. In the most recent National Greenhouse Gas Inventory, emissions (including land use, land use change and forestry – LULUCF – as reported in Australia’s National Greenhouse Accounts) are reported in table 8 as 547.7 million tonnes CO₂ equivalent for the 2014 inventory year and 563.8 million tonnes CO₂ equivalent for 1990, so this confirms Hunt’s figures for total emissions. Referring to recent UNFCCC data and including LULUCF, Australia ranks 32nd of the 43 Annex I parties (industrialised countries and economies in transition) in the percentage decline in total emissions for the period 1990 to 2012 - a 2.4% increase over the period. However, if we exclude LULUCF, and therefore consider only energy, transport, agriculture, industrial processes and fugitive emissions, Australia ranks 40th, with a reported 31% increase in total emissions over the period. As for a reduction in emissions intensity, we found that by using OECD GDP data and emissions data from the UNFCCC, Australia’s emission intensity declined from 1.79 kg CO₂ equivalent per US$ GDP in 1990, to 0.56 kg CO₂ equivalent in 2012 (the most recent year for which comparable data is available). That is a 69% decline. So how does that compare with other OECD countries? With land-use included, Australia ranks ninth out of 27 Annex I countries for which we have complete data for relative decarbonisation, and ranks 16th if we exclude land use. It is a feature of developed countries that both the energy intensity of the economy, and the carbon intensity of energy, tends to improve over time, due to technology and other factors. But many of the same drivers of productivity are also driving economic growth, hence the absolute quantity of emissions tends to be more stubborn. GDP can be calculated in various different ways, but if the same methodology is applied to all countries, the ranking remains much the same. In fact, several European countries do better than Australia regardless of the flavour of GDP used. For example, the World Bank catalogues the CO₂ emissions per PPP $ of GDP, which contrasts countries using a purchasing power parity, rather than a fixed exchange rate. Or alternatively, the OECD-95 constant-price dataset expresses GDP in real rather than nominal terms, and the relative ranking of Australia is nearly unchanged. And if we use the Australian Bureau of Statistics constant-price GDP data (A2304334J), GDP has increased by 110% over the period 1990 to 2014, and the emission intensity per unit of GDP has declined by 54%. Mr Hunt made the valid point that Australia’s economy has substantially decarbonised, relative to each dollar of economic value added, but the same process occurs internationally. In fact, several countries have decarbonised more in relative terms than Australia has since 1990. This includes a number of Scandinavian countries that had much less carbon intensive economies to begin with. As a nation with a high per-capita emission intensity, Australia’s decarbonisation effort needs to outpace GDP growth much faster than comparable countries. Mr Hunt’s challenge “to indicate if there’s any other country that has achieved a greater reduction in the intensity of their emissions per unit of GDP” since 1990 implies Australia is leading the world in emissions intensity reduction. That is not correct. The FactCheck has it right, and the authors have met the Minister’s challenge of naming countries with faster reductions in emissions intensity. A key reason is that the authors have split the EU into its member countries. Doing so identifies countries such as Poland and Luxembourg that have achieved large reductions in emissions intensity. If we expanded the list of countries further, there are some non-OECD countries that have also achieved larger reductions in emissions intensity than Australia. Russia is one example. Australia’s reduction in emissions intensity, while welcome, is thus not particularly special. It is also important to bear in mind that in terms of levels of emissions intensity and emissions per capita, Australia is a big emitter.